We promote conservation of the natural and cultural resources of the Washington Maritime National Wildlife Refuge Complex, and engage in educational, charitable, scientific, and civic activities that increase public awareness and assist management in accomplishing Refuge goals. • Refuge entrance volunteers for handled donations and pin sales, including suggestion to visitors that their change be a donation to Friends. • Provide lunch for volunteer training in the spring. • Provide food for the end-of-season picnic. • Planning and assist Refuge staff with Dungeness Discovery Day. • Discover Nature smartphone app. • Plan and assist with educational events or lectures. • Monitor and remove green crab. • Remove non-native plants and plant native species on Refuge property. • Assist with growing new native plants for future planting (garry oak, golden paintbrush, etc.). • Obtain grants for funding the Discover Nature app and Protection Island video. • Engage with community to develop event sponsor relationships. • Develop new web site. • Inform public about harmful effects of fireworks near the Refuge. 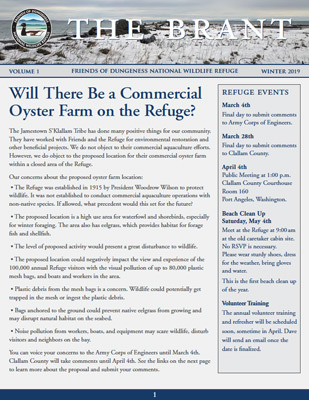 • Inform volunteers about developments that may impact the Refuge via newsletter and email. • Engage with local government officials. Want to help Friends reach these goals? You can make a donation or join us. The purpose of the Friends is to promote the conservation of the natural and cultural resources of the Washington Maritime National Wildlife Refuge Complex, and engage in educational, charitable, scientific, and civic activities that will increase public awareness and assist management in accomplishing Refuge goals.